"Easy and quick for any day of the week. Use tartar sauce for dipping if desired." Preheat oven to 450 degrees F (230 degrees C). Spray a large baking dish with cooking spray. Pour milk into a bowl. Place flour on a plate. 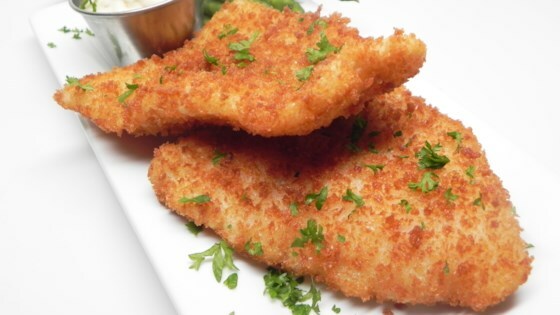 Pour panko into a shallow bowl. Dip barramundi in milk, dredge in flour, and coat with panko. Place in the prepared baking dish. Spray barramundi with cooking spray. Sprinkle garlic powder and parsley on top. Roast in the preheated oven until barramundi flakes easily with a fork, about 12 minutes. A light, flavorful Asian-inspired glaze for a mild, flakey white fish. Steam frozen vegetables as instructed on the package. Transfer to a bowl and season with olive oil, black pepper, salt, and garlic powder. Mix well and serve on the side.